Improve the layout to make the entire section easier to use. 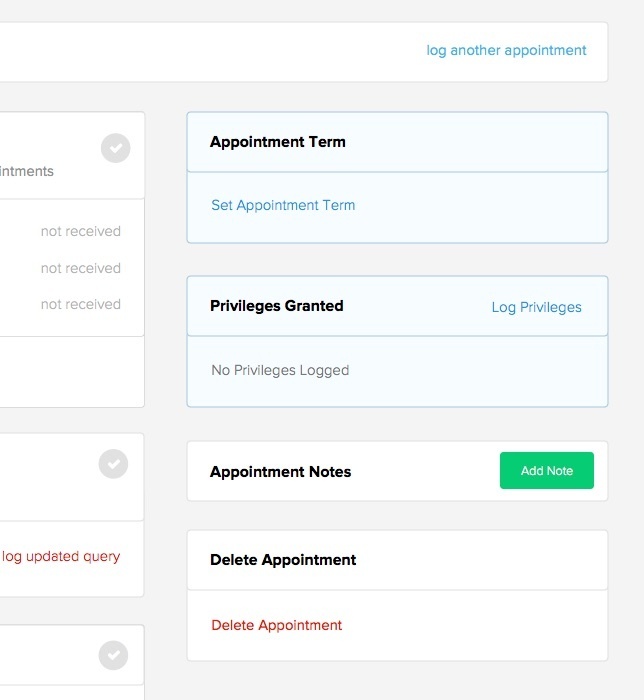 Make logging existing appointment files a lot simpler and faster. Make processing new appointments/reappointments much more streamlined. Let's dive into the details of each improvement goal! 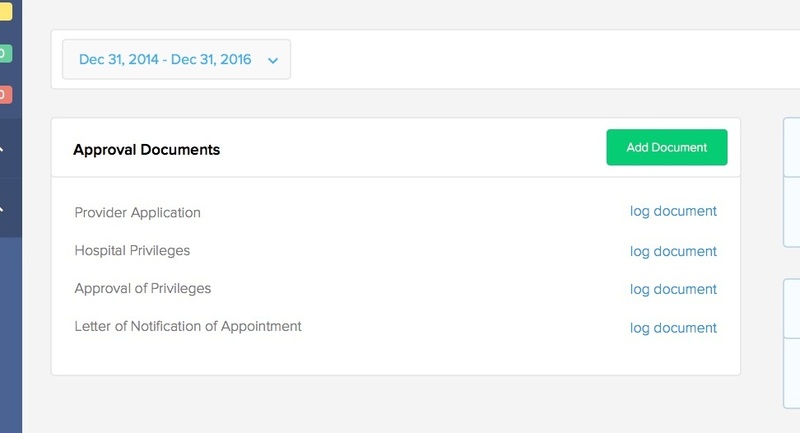 In making this section easier to navigate and use, we created an "action bar" to help organize all logged appointments, currrent and past. You can simply flip through your logged appointments by selecting the relevant appointment from the drop-down selector on the left side of the action bar. On the right side of the action bar, you can always choose to log another existing appointment or process a new one. This new action bar exists on all pages within this Appointment & Privileges section. Once you dive into a specific appointment, you'll notice the main layout is broken into 2 main sections...the main column and the right sidebar. In a nutshell, the main column is where you have your checklist of appointment related documents to log and privileging tasks to do. The main column looks different, depending on if you're logging an existing appointment or processing a new appointment...which we'll explain below in each of the improved sections. The right column is where you'd log some core details about this Appointment. This includes the appointment date and their privileges granted. Both the appointment date and their delineation of privileges will be shared with the Provider on their dashboard. This way, they'll always know their privilege information at your facility. The idea of logging an existing is simply to store in Silversheet existing/past appointment records/documents you might already have in a Provider's file. They've already gone through the appointment process, so you just need to archive the records. We made the main column extremely easy to do this with just 1 Approval Documents container. With this container, we really recommend you log at least 4 critical things: provider application, hospital privileges, signed approval of privileges, letter of notification of appointment. Along with this, you can always optionally log any type of additional documents, like AMA profile, provider correspondences. This simple set of files will make it easy to refer back to when you or an inspector needs to look back at archived appointment documentation. When you're processing a new appointment, whether it's a brand new appointment or a reappointment, you have to go through a set of tasks...we call this the appointment workflow. Our goal was to help make your appointment workflow much simpler using Silversheet, and account for storing all the records/documents while using our workflow. The first new feature you'll notice in this workflow is Application Packet module. 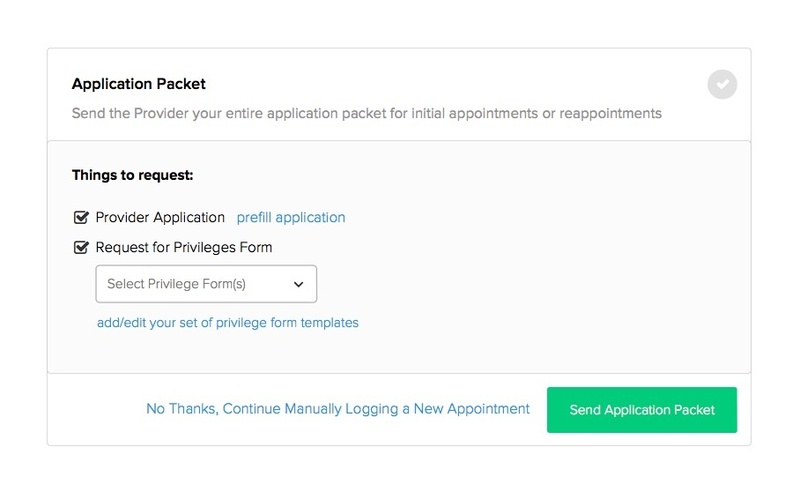 This new module lets you bundle a request for provider application and request for privileges...direct through Silversheet. If the Provider has a free Silversheet account, they'll be able to fill out, sign, and submit both their provider application and their request for privileges entirely digitally using Silversheet. Less paperwork for everyone! Along with this new module, there will be three other modules guiding you through critical steps in your appointment workflow: helping you log your NPDB, hospital privileges, and approval documents related to this appointment. The last new module is our Incomplete Sections module. 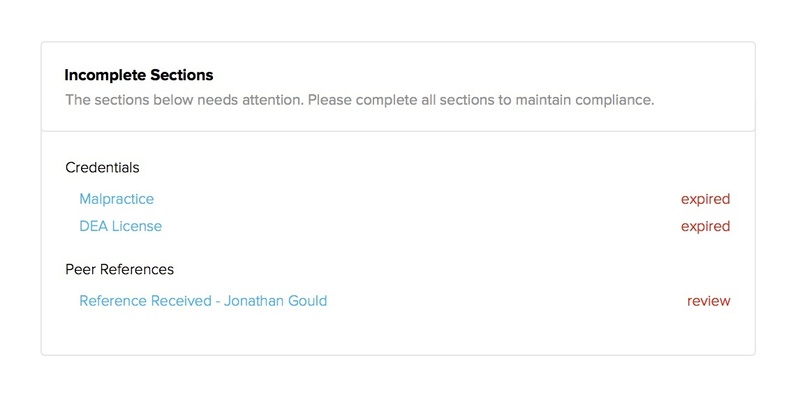 This module simply shows you if other areas of your Provider file is in good order. This module will point you to the other tabs (e.g. credentials, sanctions, peer references, and health documents) to make sure your entire provider file is complete and up-to-date.